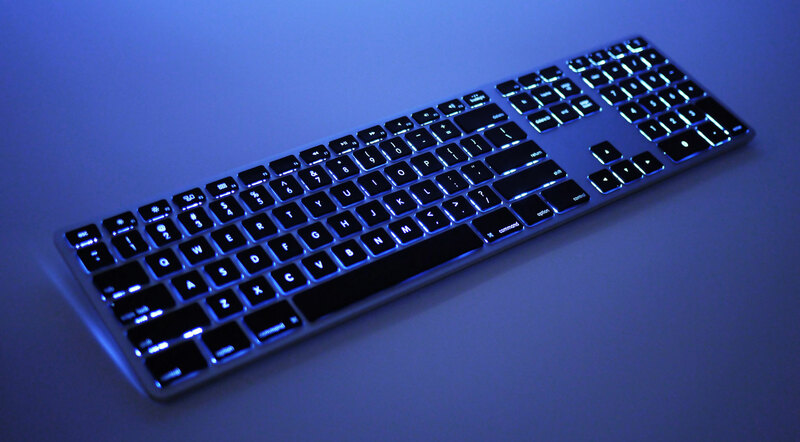 Improved Visibility In Poorly Lit Workstations - The backlighting on the Wireless Aluminum Keyboard with Backlight provides clear contrast in low-lit or otherwise less than ideal workstations which present challenges to seeing the keys on the keyboard clearly. This will reduce strain on the user and potential awkward postures in the upper body from straining or positioning to see the legends on the keycaps. Reduced Risk of Wrist Extension - The Wireless Aluminum Keyboard with Backlight presents a low front profile which means that there is not a significant difference between keyboard height and the work surface. For users who "rest" the heel of their hands when keyboarding low profile can reduce the risks associated with wrist extension. Learn more about Wrist Extension. Reduced Risk of Shoulder and Back Pain - Keying on mobile devices or compact computers requires users to position their hands unnaturally close together. This requires them to roll their shoulders in and usually also down. This puts undue strain on both the shoulders and the upper back. Extended use of devices requiring this posture can have a noticeable effect on the health of the shoulders and back. The Wireless Aluminum Keyboard with Backlight addresses this by providing users with a means of entering data on these devices without the space limitations of the device screen. In addition, the ability to quickly switch between devices means that those working with multiple devices may actually be able to increase their productivity since they no longer have to switch between devices. Reduces Risk of Developing "Texting Thumb" - The tight positioning that is required on cell phones encourages users to rely heavily on the thumbs for data input. This is known to often trigger inflammation and irritation of the thumb tendons. Left unchecked this can easily develop into the debilitating condition knows as De Quervain Syndrome. 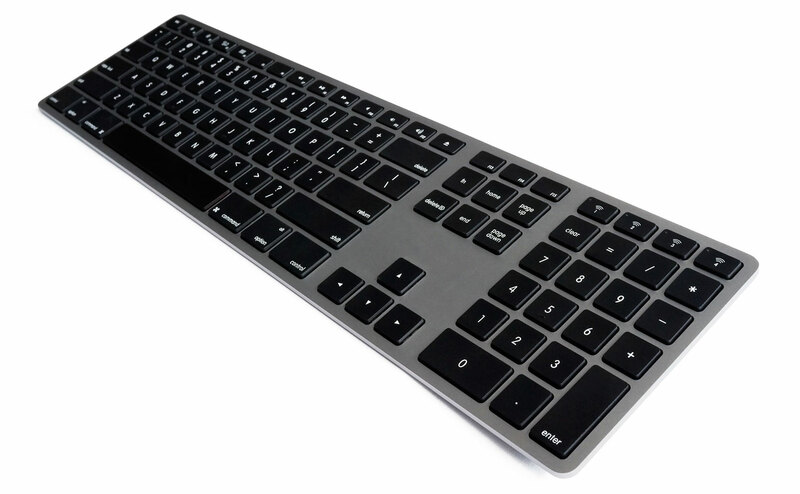 The Wireless Aluminum Keyboard with Backlight addresses this by providing users with a full width keyboard of standard spacing which engages the entire hand into the data entry. Reduced Risk of Neck Pain - By providing users with a means of entering data on their mobile device without the need to hold it in their hands the Wireless Aluminum Keyboard with Backlight frees the user to position the device(s) at a height and angle better suited for viewing. This can reduce or eliminate the need to bend the neck by permitting the user to maintain an appropriate viewing level. Load Balance Workload - Using one input device to access multiple platforms (Computer, Tablet, Cell Phone) allows people to load balance their workflow and activities throughout the day, as one works on each of these devices in different ways, typically moving more with tablets and phones and less with computers. 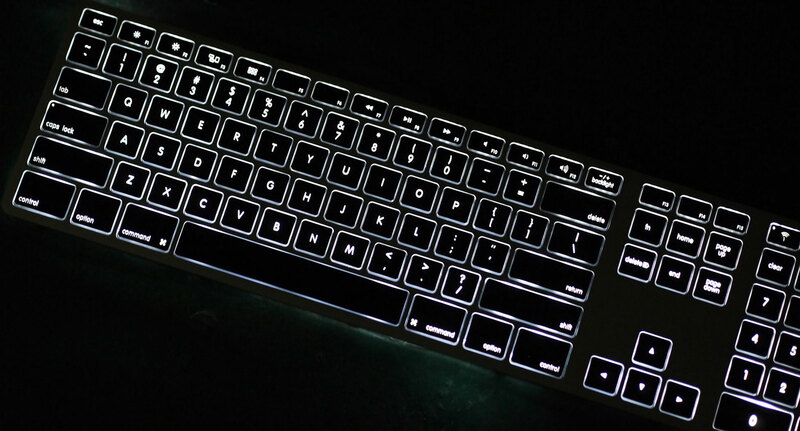 Backlighting with Own Dedicated Rechargeable Battery: The Wireless Aluminum Keyboard with Backlight has variable intensity backlighting for any light conditions from daytime and full-light to complete darkness at night. The backlighting has its own dedicated 1,400 mAh rechargeable battery so that, even if the backlighting power runs out, the keyboard will continue to function as normal. Light intensity varies in 10% increments, form 0 to 100%. Time between charges will vary with the intensity and duration of usage of the backlight. 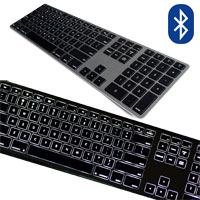 Bluetooth Connection: The Wireless Aluminum Keyboard with Backlight employs Bluetooth for its wireless connection. This ensures quick connection to paired devices regardless of the operating system. Multi-Device Capability: The Wireless Aluminum Keyboard with Backlight is capable of pairing with up to 4 Bluetooth Devices. Mac, iOS, Android, or Window operating systems can all be accessed at the touch of a button, making this keyboard a true multi-platform device. Device Directed Layout: The Wireless Aluminum Keyboard with Backlight determines the operating system of the device being connected to and automatically adjusts its layout accordingly. Extended Life Rechargeable Battery: The Wireless Aluminum Keyboard with Backlight is equipped with a 1,600 mAh rechargeable battery capable of providing up to a year of wireless connectivity on a single charge. Recharging is as simple as connecting the USB power cord. "Always ON" Connection: Unlike most other keyboards which will power down or shut down connections to conserve battery power, the oversized rechargeable battery enables the the Wireless Aluminum Keyboard with Backlight to maintain connections at all times. Pairing is maintained with all devices, ensuring an "immediate" connection as soon as they are turned on or within range. Integrated Numeric Keypad: Unlike the Apple Wireless keyboard, the Wireless Aluminum Keyboard with Backlight includes a full numeric keypad, which provides Apple users with complete keyboard functionality in a keyboard with expanded wireless capabilities. Low Profile Design: The Wireless Aluminum Keyboard with Backlight employs a "chiclet" or "island" keycap which permits a very low profile. The profile tapers from 3/4" at the back to just 3/8" thick at the front, presenting a slightly angled profile to the user. Classy Colours: Apple MacBook users can choose a keyboard colour to match the housing on their computer. Colours available are Silver and Space Gray. Non-reflective Finish: All colours of the Wireless Aluminum Keyboard with Backlight feature a matte anodized finish which eliminates reflection and glare. It also means fingerprints are not visible. Sturdy Aluminum Housing: The upper housing on the Wireless Aluminum Keyboard with Backlight is of aluminum which ensures strength and rigidity.